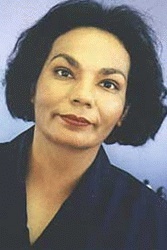 Alice Cedeno was born in Salinas, California, of Mexican parents. "I'm 100 percent Mexican," she says. She moved to Anchorage in 1974, and opened Alice's Hair Design in 1982. Her memoir, Ama, was a labor of love, which she began after her mother's death and completed in 1998. As Ama was nursing her second child, her first born son was withering away. He looked more sickly each day. She held him close to her breast, but he refused to nurse. She watched him turn his head away from the life-giving nourishment. She knew that something was terribly wrong. At first she thought it was her milk, so she tried to make him his own agua de arose. Still he refused to drink. The baby was dehydrated, burning away from the inside out. By the third day, he just lay like a rag doll, his eyes open like two small pieces of glass pasted to his face. Fever consumed his body. Dona Demetria wrapped him in mud to cool down the fever, but there was no change. His once pudgy hands were now just little bones, and his little face was only an outline of what it had been. Soon, his eyes could no longer open all the way. Dona prayed, sprinkled his body with holy water, and retried all her old remedies. Ama did her mandas and lit candles from morning to night. After fifteen days, he finally closed his eyes. His color had faded from healthy, living flesh to the pale blue of death. The tiny child was buried wearing a little shroud made by his grandmother and a tiny scapular that once had been wrapped around his chubby neck. Now it hung loosely. Ama believed that Mother Mary would recognize and embrace this child buried with her own cloth. Crying inside for her little lost baby, she was still able to give love and attention to her second nino. She soon began to notice this baby's life slipping away in the same manner as the first baby. The cycle repeated itself. Now, as she began to lose her second child, her once pleasurable trips to the river were repeated in torment. On her knees, with her arms outstretched as if she could see God and reach in His direction, she pleaded, "Why is this happening to me? Why am I being punished? Why do you let me see their first smiles and hear them call me mother? Please don't give me any more babies if you are going to take them away!" She bowed her head, letting her tears join the river water, for she was about to bring her third baby into this world. Meanwhile, her second baby died. The time of the agulos is the time of year that nature flourishes. Everything blooms and people nourish themselves from the crops produced during this time of plenty. Ama's third baby was thriving, looking healthy, fat, and rich brown. Terrified by the past, she dropped to her knees to pound the ground with clenched fists. She pleaded to the mother of all Mexicans, and mother of all Indian origins, la Virgen de Guadalupe, "You know the pain of being a mother. Please don't take this baby away." But as the seasons ended and the fruit withered, so did Ama's third baby. The baby died just like the others. Ama was not crying alone. Death was all around, brought by an epidemic of scarlet fever. By now, Ama was eighteen years old, unable to be comforted by the only person who truly cared for her; her grandmother, Abuelita. The only news she received about her family was an occasional tidbit from a vendor who knew her parents. When her loneliness and the anguish of her losses overtook her and she allowed the pain to show, Dona Demetria would tell her, "Tienes que aguantar. Tienes que ser mujer." You have to put up with it. You must be a woman. Dona would also tell her, "Why should you cry for something that has no solution?" Within the next year, her fourth baby arrived. He lived past the sixteen-month danger point and Ama began feeling hopeful. Fooled by life, she began to do things she was unable to do before. She crocheted bigger booties and made little outfits for her healthy baby. Her joy, however, was short-lived. As he turned two, he became ill and eventually joined his three brothers. Another scar was added to her pierced heart. Ama never let any of us forget our brothers. The only memento we had of these small seeds of life was a picture of one of the babies. That picture became a symbol of all four of them. Pointing to the picture of the baby with the dark, deep-set eyes and long, fanning eyelashes, the double chin, and perfect little arms and fat legs, people would ask who the child was. We always answered, "He is our brothers."